china's agricultural revolution has come at a cost. With farmers abandoning the millennia-old tradition of growing rice in favour of fruits and vegetables, the soil quality has declined owing to the application of too much fertiliser. This is causing a profound and detrimental affect on the agricultural produce. These are the findings of a study by researchers from the government's Institute of Soil Science, Nanjing. They found that fields growing fruits and vegetables for just five years are becoming more acidic and barren. The levels of nitrogen and phosphorus have exceeded the safe limit and fungal epidemics have become very common (Environmental Geochemistry and Health, vol 26, p 97-103, 2004). Since 1998, the land under grain crops has plummeted by 15 per cent. In August 2004, officials confirmed that grain yields have fallen by one-fifth this year, and consumption is expected to exceed production by a record 37 million tonnes. Rice and wheat cultivation has been abandoned due to the following factors: firstly, China assumed it had solved its food security problem by the end of the 1980s; secondly, the country is speedily urbanising, with cities eating into farmland. Already 500 million Chinese live in towns and cities, and the government wants that to rise to 800 million by 2020. The urban dwellers are willing to pay the high prices of fruits and vegetables. And the government is encouraging farmers to meet this soaring demand by converting rice and wheat fields to grow the more profitable foodstuff. In the past decade, farmers converted 13 million hectares -- an area the size of England -- into fruit and vegetable farms. This unprecedented change was followed by an intensive use of fertilisers -- while China harvests a quantity of crops similar to the us, it uses almost twice as much fertiliser. During the study conducted in the Jiaxin prefecture, researchers found that soils of fields now used for growing vegetables are becoming dramatically more acidic, with average ph rising from 6.3 to 5.4 in 10 years. Furthermore, the salt content of the top layer of soil was 0.28-0.3 per cent. This is alarming, as the level should not exceed beyond 0.1 per cent. The high salt levels have affected vegetable growth dramatically, and in some places plants have perished. The researchers found that soluble salts in soil were about 32.5 per cent higher in places where plants showed physiological disorders than in areas with normal flora growth. The high soil content was attributed to the extensive use of potassium chloride- and ammonium hydrocarbonate-based fertilisers. 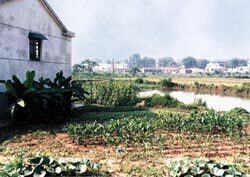 The soil nitrate levels in fruit and vegetable farms were found to be four times more than that in paddy fields; phosphate levels were tenfold higher. This is a cause of concern -- phosphates and nitrates leach into the aquifers and contaminate groundwater and wells. They also promote eutrophication -- undesirable growth of algae and weeds due to the presence of excessive nutrients. Already, one-third of the country's wells have nitrate levels above the norms. The researchers discovered that all these factors had led to an equally dramatic decline in soil bacteria and a rise in fungus epidemics. This has hit yields and the quality of vegetables and fruits. "Some plants show abnormal growth and deformed fruits. Plant diseases that are not easy to control by the usual pesticides are even rampant," says Cao Zhihong, one of the study's authors. According to him, one of the best ways out is to switch over to organic farming. Else, the country, which is home to one-fifth of the world's population, may soon be unable to feed itself.